Parasitic plants are divided into two main groups: holoparasites, which derive all their nutrients from another living plant or from a fungus, and hemiparasites, which to some extent are able to produce nutrients through photosynthesis. In the Greek, hemi means ‘half’. To me, the term half-parasite seems rather odd. Either you are a parasite, or you are not! About 20 families of parasitic plants, comprising c. 4,500 species, are known, distributed across almost the entire planet. Almost all species have sucking organs, named haustoria, which are modified roots, penetrating the host plant and extracting water and nutrients from it. This family is huge, containing about 90 genera and more than 2,000 species. 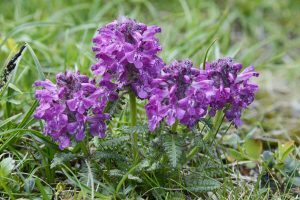 The family name is derived from the Greek orobos (‘bean’) and ankhein (‘to strangle’), alluding to the bean broomrape (Orobanche crenata), which is a common parasite on the fava bean (Vicia faba). This species is presented below. Many genera in this family are hemiparasites, which were formerly included in the figwort family (Scrophulariaceae). Following extensive DNA research, they have been moved to the broomrape family. Some of these genera are dealt with in the caption Hemiparasites. 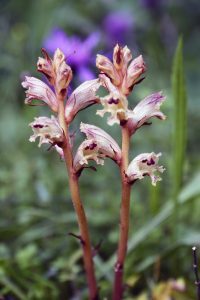 Broomrape (Orobanche) is a genus of over 200 species, native mainly to the temperate Northern Hemisphere. Knapweed broomrape (Orobanche elatior) is a large species, growing to 70 cm tall. It is partial to greater knapweed (Centaurea scabiosa), occasionally found on other species of knapweed and rarely on members of the daisy family (Asteraceae) and buttercup family (Ranunculaceae). This species grows in open areas, only on alkaline soils. It is found in most of Europe, eastwards through West and Central Asia to the Gansu Province of China. As its popular name implies, thyme broomrape (Orobanche alba) is partial to thyme (Thymus), occasionally growing on oregano (Origanum) and savory (Satureja) species. It has a wide distribution, found in most of Europe, eastwards through Russia and south-western Asia to Tibet and the Himalaya. 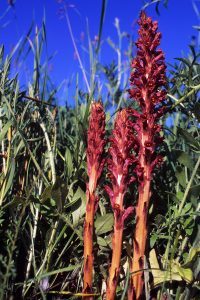 In Asia, it has been encountered up to an altitude of 3700 m.
Anatolian broomrape (Orobanche anatolica) is found from Turkey and Iraqi Kurdistan, eastwards to the Caucasus. It grows exclusively on species of sage (Salvia). Toothwort (Lathraea) is a small genus of five to seven species, native to Europe and Asia. The generic name is derived from the Greek lathraios, meaning ’clandestine’, which refers to the fact that the entire plant is hidden underground, except when it is flowering. Its whitish underground stem is covered in thick, fleshy leaves with rows of tooth-like scales, giving rise to the popular name of this genus. The common toothwort (L. squamaria) is distributed in almost all of Europe and in Turkey, with an isolated population in the Western Himalaya, which may well be a separate species. This plant is parasitic on roots of hazel (Corylus), and occasionally on elm (Ulmus), ash (Fraxinus), alder (Alnus), walnut (Juglans), and beech (Fagus). Ground-cones (Boschniakia) is a small genus of three species, native to western North America and extreme northeastern Asia. The part above ground is a very compact cone-shaped cluster of flowers, which gave rise to their popular name. The flower colour may be yellow, red, brown, or purple. The small ground-cone (B. hookeri) is found in forests, from British Columbia south to northern California. It grows on salal (Gaultheria shallon) and huckleberry species (Vaccinium). In former days, coastal tribes ate the potato-like base of the stem raw. Aeginetia is a small genus of c. 3 species, growing in open areas on the Indian Subcontinent, eastwards to Japan and Korea, and thence south through Southeast Asia and Indonesia to New Guinea. 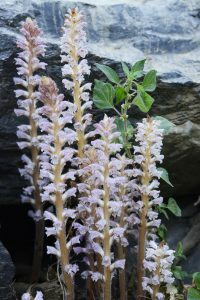 Aeginetia indica, sometimes called Indian broomrape, is parasitic on roots of various grass species, including bamboo, rice, maize, and sugarcane. It is widely distributed, found from Uttarakhand, north-western India, eastwards to China and Japan, and in Tropical Asia. In Himalayan folk medicine, its root and flowers are used for treating infections and skin problems. The genus Conopholis only has two members, both found in North America. Alpine squawroot (C. alpina), or alpine cancer-root, is native to Texas, Colorado, New Mexico, Arizona, and northern Mexico. Despite the common name cancer-root, there is no evidence that it has any anti-cancer properties. A variety of this species, var. mexicana, called Mexican squawroot, is parasitic on roots of various species of pine (Pinus) and oak (Quercus). It was formerly used by indigenous tribes against tuberculosis. Cistanche phelypaea is native to the Iberian Peninsula, Italy, northern Africa, Somalia, the Arabian Peninsula, Jordan, Syria, and Cyprus, being a parasite on bushes in sandy soils. It is used medicinally in Somalia for diarrhoea and menstrual disorders. 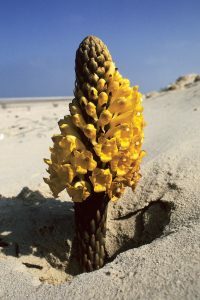 Cistanche tubulosa, sometimes called desert broomrape, is found in deserts, from northern and eastern Africa eastwards to India. Favourite hosts of this species are bushes of the genera Salvadora, Haloxylon, Zygophyllum, and Cornulaca. In Chinese medicine, it is sometimes used as a substitute for C. deserticola. 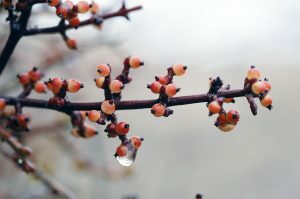 Beech-drops (Epifagus virginiana) is the sole member of the genus Epifagus, derived from the Greek epi (‘on’), and the Latin Fagus, the generic name of beech. This species is parasitic on roots of the American beech (Fagus grandifolia), hence its name. It is distributed in the eastern half of North America, from Hudson Bay south to Texas and Florida. Superficially, plants of the genus Balanophora resemble fungi, but they are in fact seed plants, belonging to the family Balanophoraceae, which contains 17 genera with c. 44 species. The genus Balanophora (and the entire family) is named from the inflorescence, which is covered by bumps, resembling barnacles (family Balanidae). These plants obtain their nutrients from tree roots. They are found in subtropical and tropical areas around the globe, with a few species extending into temperate regions. Balanophora dioica has a wide altitudinal range, found in forests between 400 and 2,600 m, from central Nepal eastwards to China and Taiwan. Formerly, the genus Cynomorium was regarded as belonging to the family Balanophoraceae (above), but DNA research indicates that it constitutes a separate family, Cynomoriaceae. This genus contains one or two species, C. coccineum of the Mediterranean region, eastwards to Afghanistan and Iran, and C. coccineum var. songaricum (or C. songaricum) of Central Asia. Cynomorium coccineum is sometimes called Maltese fungus due to its fungus-like appearance, while other names include desert thumb and red thumb. This species is quite rare, growing in rocky or sandy soils, often near the coast. It is parasitic on roots of various shrubs of the cistus family (Cistaceae), the amaranth family (Amaranthaceae), and the tamarisk family (Tamaricaceae). This huge family contains a few parasitic genera, all members of the subfamily Monotropoideae, which used to constitute a separate family, Monotropaceae. Following genetic research, this family is now included in the heath family. Monotropa is a genus of 5 species, native to temperate areas of the Northern Hemisphere. The generic name is from the Greek monos (‘alone’, or ‘single’) and tropos (‘to turn’), referring to the flowers of M. hypopitys, which all point in the same direction. 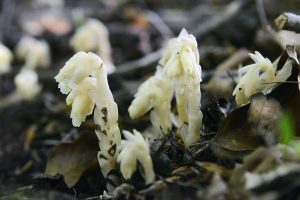 Pinesap (Monotropa hypopitys), also called Dutchman’s pipe or yellow bird’s-nest, is found throughout Europe, in northern Asia, south to the Himalaya and Thailand, and throughout North America, south to Mexico. It is parasitic on mycorrhiza of the genus Tricholoma. The name yellow bird’s-nest refers to its thick, tangled root, which somewhat resembles a bird’s nest, and the part yellow from its yellowish flowers. Dutchman’s pipe, of course, refers to the flower shape. There is some controversy about the specific name of this plant. Swedish botanist Carolus Linnaeus (1707-1778), also called Carl von Linné, spelled the name hypopithys. In the Greek, hypo means ‘under’, while Pithys was the name of a wood nymph in Ancient Greek mythology, thus ‘under the nymph’. Linnaeus was known to be sometimes a bit of a prankster. Was he referring to the tangled inflorescence, which may resemble the tangled pubic hairs of a woman? Or did he simply misspell the name? Modern taxonomists spell the name hypopitys (without an h), where pitys (‘pine’) refers to one of the habitats of this species, as it often grows in dark pine forests. 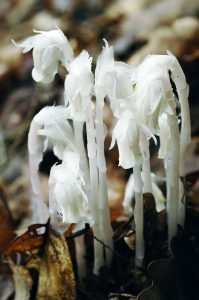 The ghost plant (Monotropa uniflora) differs from pinesap in being pure white, hence its popular name. 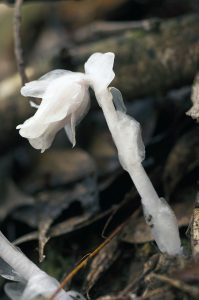 Another name is Indian pipe, which, of course, refers to the flower shape. The specific name means ‘one-flowered’. As opposed to pinesap, the inflorescences of this species only have a single flower. Ghost plant is native to North and Central America, southwards to Columbia, and in eastern Asia, from the Himalaya eastwards to Japan and Sakhalin, and thence south to Taiwan. It grows in forests, being parasitic on mycorrhiza of the family Russulaceae. It has been widely used in western herbal medicine to calm the nerves. The snow plant (Sarcodes sanguinea), which derives its nutrients from underground fungi, is distributed from the Cascade Range of Oregon, south through montane areas of California to northern Baja California, Mexico. American botanist, chemist, and physician John Torrey (1796-1873) found the colour of this plant so striking that he named it Sarcodes sanguinea, from the Greek sarkos (‘flesh’) and the Latin sanguis (‘blood’), thus ‘the blood-coloured fleshy one’. The common name refers to the early flowering of this species, which often appears, when snow is still covering the ground. 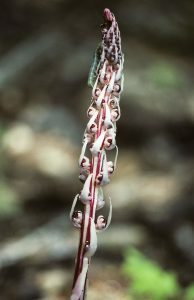 Candystick (Allotropa virgata) is a striking plant, growing to 50 cm tall, found in forests up to an elevation of 3,000 m, from California northwards to British Columbia and eastwards to Montana. The popular names of this plant, candystick, sugarstick, and barber’s pole, refer to its peculiar red-and-white-striped appearance, the latter name alluding to the poles with a helix of red and white stripes (in America also often blue), which used to signify a barber’s shop. Dodders (Cuscuta), between 100 and 170 species, used to constitute a separate family, Cuscutaceae, but have now been moved to the morning-glory family – the only parasitic members of that family. Dodders are distributed almost worldwide, with the greatest concentration in the tropics and subtropics. Temperate areas have much fewer species, including northern Europe, where only four species are native. In hot climates, dodders are perennials, growing more or less continuously, while in colder areas they are annuals. These plants twine around other plants, often completely enveloping them in their yellow or reddish stems. 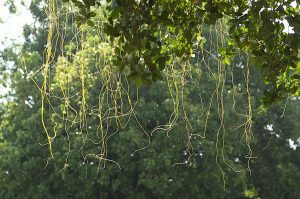 A dodder seed starts its life like most other seeds by sending roots into the soil, from which grow stems, whose leaves are reduced to scales. When a stem gets into contact with a suitable plant, it wraps itself around it, inserting haustoria into the plant, through which the dodder obtains water and nutrients. Its root in the ground then dies. Their strange appearance taken into consideration, it is hardly surprising that dodders have many folk names, including strangleweed, scaldweed, beggarweed, lady’s laces, wizard’s net, devil’s guts, devil’s hair, devil’s ringlet, goldthread, hailweed, hairweed, hellbine, pull-down, angel’s hair, and witch’s hair. The generic name is derived from the Arabic name of dodders, kusuta, or kuskut, which, in the form Cuscuta, was applied to them by Rufinus, an Italian monk and botanist, who was the author of De virtutibus herbarum, completed c. 1287, which listed nearly a thousand medicinal materials, mostly plants. 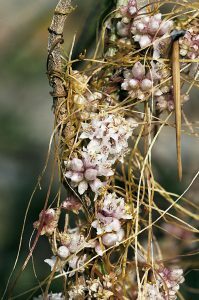 Giant Asian dodder (Cuscuta reflexa) is widely distributed, found from Afghanistan across the Indian Subcontinent and southern Tibet to south-western China, and thence south through Southeast Asia to Indonesia. In some areas, this proliferate species is regarded as a serious pest, including Valley of Flowers National Park, Uttarakhand, northern India. 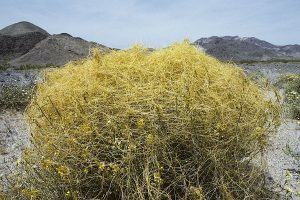 Californian dodder (Cuscuta californica), also called chaparral dodder, is common in western North America, found in grasslands, pine forests, and chaparral (a community of shrubby plants, adapted to dry summers and moist winters, which is typical of southern California). 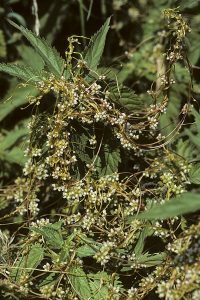 Greater dodder (Cuscuta europaea) is partial to common nettle (Urtica dioica), although it can grow on plants of many other families. This species is a native of Temperate Eurasia and North Africa. It often has red stems. 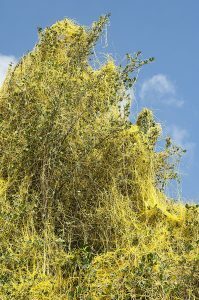 Lesser dodder (Cuscuta epithymum) is native to Europe, northern Africa, the Middle East, and northern Asia, eastwards to central Siberia and Sinkiang, but has been accidentally introduced to many other parts of the world. Its most common host species are heather (Calluna vulgaris), gorse (Ulex europaeus), and clover species (Trifolium). 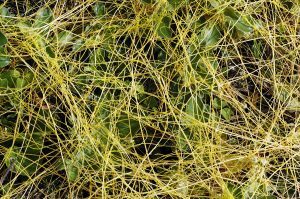 Southern dodder (Cuscuta australis) has a very wide distribution, found from Africa across the Middle East to India and the Far East, and thence southwards through Southeast Asia and Indonesia to New Guinea and Australia. This family is dealt with in detail above. Many of its genera were formerly included in the figwort family (Scrophulariaceae), some of which are presented below. Cow-wheat (Melampyrum), comprising c. 40 species, are distributed in arctic and temperate regions of the Northern Hemisphere, south to Spain, Turkey, China, and the Carolinas in America. Common cow-wheat (Melampyrum pratense) is found in all of Europe, eastwards to central Siberia, north to the Arctic coast. Formerly, this species was readily eaten by cows. It contains large quantities of dulcit, a saccharide, and the fact that it also contains a toxic glycoside, rhinanthin, did not seem to harm the cattle. The seeds are dispersed by ants of the genus Formica, which eat a fleshy structure on the seed, called elaiosomes. Field cow-wheat (Melampyrum arvense) is distributed almost throughout Europe, eastwards to the Ural Mountains and Kazakhstan, growing in grasslands. Its seeds are poisonous, containing aucubin. Previously, this species was a common weed in fields, but has become rare due to more efficient treatment of crop seeds. 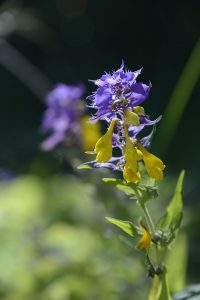 Some popular names of the wood cow-wheat (Melampyrum nemorosum) include natt-och-dag (‘night-and-day’ in Swedish) and Ivan-da-Marya (‘Ivan-and-Maria’ in Russian), both names referring to its striking inflorescences, with yellow flowers and bright purplish-blue bracts. This species is mainly a plant of eastern Europe, found from Denmark, Germany, and Italy, eastwards to north-western Russia. Small cow-wheat (Melampyrum sylvaticum) can be identified by its small yellow flowers. This species, which is found all over Europe, including Iceland and north-western Russia, is particular to coniferous forests. Previously, the genus Bartsia counted 49 species, 45 of which are endemic to the Andes. 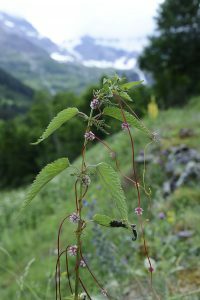 Recent genetic studies, however, have led to a revision of this genus, placing most species in a new genus, Neobartsia, leaving only one species in Bartsia, namely the alpine bartsia (B. alpina), also called alpine bells. Bartsia is named after a Prussian botanist, Johann Bartsch (1709-1738) of Königsberg. The famous Swedish botanist Carolus Linnaeus (1707-1778), also called Carl von Linné, advised him to participate in an expedition to present-day Suriname as a doctor, but, unfortunately, he perished during this journey. Linné honoured him by naming this plant after him. Alpine bartsia is distributed in montane and arctic areas of Europe, eastwards to central Siberia, and also in Greenland and north-eastern Canada. The purple colour of this plant repels harmful UV-radiation in the open places, where it grows. The genus Odontites, called red bartsia or false bartsia, numbers c. 37 species, distributed in all of Europe, north-western Africa, the Middle East, and northern Asia, south to Mongolia and Kazakhstan. Formerly, this genus was included in Bartsia (above), which is the reason for its popular names. 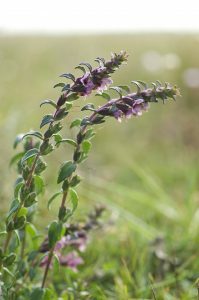 Salt bartsia (Odontites litoralis) is found in northern Europe, from Norway and Finland, south to Holland, Germany, and Poland. It always grows near the coast, preferably on littoral meadows, but sometimes on rocks. 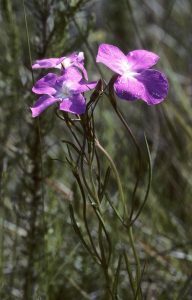 Witchweeds (Striga) are a genus of c. 34 species, distributed across Africa, on the Arabian Peninsula and the Indian Subcontinent, in Southeast Asia, and in northern Australia. They are parasitic on grass roots. Despite its specific name, Asiatic witchweed (Striga asiatica) is distributed in most of Africa, on the Arabian Peninsula, on the Indian Subcontinent, and in Southeast Asia. This species is a serious pest on crops like sorghum, maize, rice, and sugarcane, especially among subsistence farmers in Africa. About 227 species of eyebright (Euphrasia) are distributed across most of the world, with the exception of sub-Saharan Africa and parts of North and South America. The usage of these plants for eye problems goes back to medieval Europe. Followers of the Doctrine of Signatures claimed that the Great God had made all plants, so that humans would recognize the usage of them. To them, the red streaks on the petals of eyebright resembled bloodshot eyes, and for this reason, this plant would be an effective remedy for eye diseases. For once, the followers of the Doctrine of Signatures hit the nail on the head, as the plant is still recommended for conjunctivitis (‘red eyes’), infection of the eyelid, and discharge from the eyes. The generic name is from the Greek, derived from Euphrosyne (’gladness’), the name of one of the three graces who was distinguished for her joy and mirth, probably given to the plant because of its properties as a medical herb. – A popular French name for the plant is casse-lunettes, which loosely translates as ‘throw away your glasses’. 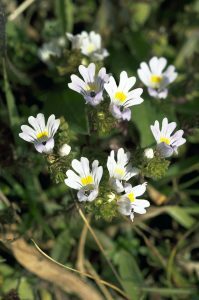 Read more about the medical usage of eyebright on the page Traditional medicine. There is great controversy as to how many species of yellow-rattle (Rhinanthus) exist, as they vary a lot and are notoriously difficult to distinguish. Most authorities say between 30 and 40 species, distributed in Europe, northern Asia, and North America, the majority in Europe. They grow in grasslands, often abundantly. Their flowers are much visited by bumblebees (Bombus). 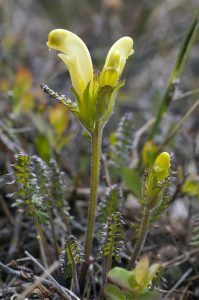 The name yellow-rattle refers to the yellow flowers of this genus, which turn into thin-walled capsules, surrounded by a dry, membrane-like calyx. When the wind blows, the seeds inside the capsule make a rattling sound. The generic name is from the Greek rhinos (‘nose’) and anthos (‘flower’), referring to the nose-like upper lip of the corolla. Greater yellow-rattle (Rhinanthus major, also called R. angustifolius or R. serotinus) grows in grasslands in most of Europe, eastwards to central Siberia, Kazakhstan, and Mongolia. 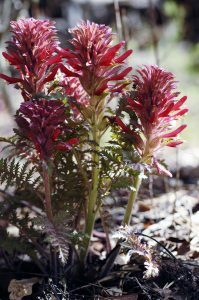 The genus Castilleja, commonly known as Indian paintbrush or prairie-fire, counts about 200 species, most of which have brilliant red flowers and bracts, while a few are orange, yellow, or violet. These plants are native to the western parts of the Americas, from Alaska south to the Andes, with one species, C. pallida, found across Siberia, south to the Altai Mountains and west to the Kola Peninsula. Other Castilleja species are presented elsewhere, see In praise of the colour red. Desert paintbrush (Castilleja chromosa, also called C. angustifolia) is quite common in arid areas, from the Pacific States east to Wyoming and Colorado, and from northern Idaho south to the Mexican border. Monterey paintbrush (Castilleja latifolia) is endemic to a very limited area along the Californian Pacific Coast, from San Francisco Bay south to Monterey, growing in coastal shrub and on sand dunes. Its bracts are usually red, but a yellow form is sometimes seen. Previously, purple owl’s clover (Castilleja exserta), also called red owl’s clover, was placed in the genus Orthocarpus, under the name of O. purpurascens. It is native to north-western Mexico and to the American states of California, Arizona, and New Mexico. In former days, indigenous peoples of California harvested the seeds for food. Incidentally, this species is crucial as a host plant for the Bay checkerspot butterfly (Euphydryas editha ssp. bayensis), a threatened subspecies of the family Nymphalidae, which is endemic to the San Francisco Bay area. Ghikaea speciosa is the sole member of the genus Ghikaea, distributed in dry habitats of south-eastern Ethiopia, Somalia, and northern Kenya. The number of lousewort species (Pedicularis) differs enormously according to various authorities, from about 350 to 600. These plants are distributed across almost the entire Northern Hemisphere, from the Arctic coasts south to Columbia, north-western Africa, Iran, the Himalaya, and southern China. The highest diversity is in China, which has 352 species, of which 271 are endemic. The generic name is derived from the Latin pediculus (‘louse’). According to an old superstition, louseworts could transfer lice to people and cattle, or, according to another belief, the exact opposite was the case, namely that they were able to rid people and cattle of lice! In Denmark, a decoction of these plants was used to expel lice from clothes. Usually, animals do not graze on these plants, as they contain poisonous glycosides. 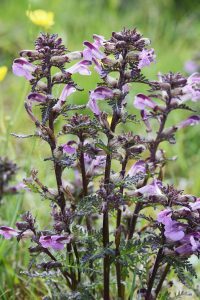 As its name implies, marsh lousewort (Pedicularis palustris) grows in wetlands, occurring in most of Europe, eastwards to Kazakhstan, Sinkiang, and Mongolia. It is also found in northeastern North America. Long-tubed lousewort (Pedicularis longiflora ssp. tubiformis), by some authorities regarded as a separate species, P. tubiformis, is ubiquitous on the Tibetan Plateau, growing in wet alpine meadows and along lake-sides. It is distributed from northern Pakistan eastwards to south-western China, found at altitudes between 2,700 and 5,300 m.
The woolly lousewort (Pedicularis lanata) is found in Alaska, northern Canada, and north-eastern Siberia, south to north-eastern China. Despite containing toxic glycosides, this and the above species are sometimes browsed by caribou (Rangifer tarandus). Pedicularis densiflora is usually known by its two popular names, Indian warrior and warrior’s plume, referring to its dense inflorescence, which somewhat resembles a Native American warrior’s plume. The specific name means ‘dense-flowered’. This plant is distributed in California and Oregon, growing at low elevations in woodlands and chaparral (a community of shrubby plants, adapted to dry summers and moist winters, which is typical of southern California). It is parasitic on roots of other plants, mainly of the health family (Ericaceae). Formerly, it was used by indigenous peoples to relax tired muscles, and buds and flowers were smoked as a mild intoxicant. Bull elephant’s head (Pedicularis groenlandica) is found in Arctic Canada and Greenland, and in high mountains of western North America. It grows in wet areas, especially along riverbanks. 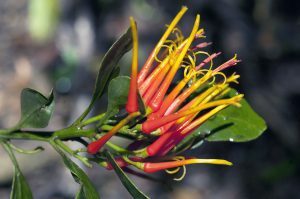 The flower of this species has a long, pointed beak, which curves upward, resembling an elephant’s lifted trunk, while the lateral lobes resemble an elephant’s ears. Beaked lousewort (Pedicularis rostrato-capitata) is found in the eastern part of the Alps, from eastern Switzerland eastwards to the Julian Alps and the Carpathians. It grows on limestone screes and in grassland, up to an altitude of 2,800 m.
Cycnium is a genus of about 17 species, indigenous to sub-Saharan Africa. They are usually parasitic on grass roots. 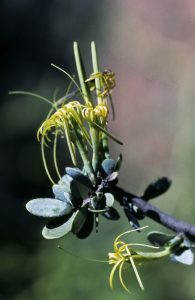 Previously, a number of hemiparasites on trees were all called mistletoes, placed in the family Viscaceae. However, extensive DNA research has caused this family to be abolished, and its members have been moved to three other families, Santalaceae, Loranthaceae, and Misodendraceae, all in the plant order Santalales. Members of all three families are presented below. Mistletoes (Viscum) are a genus of about 70-100 species, native to Europe, Africa, Asia, and Australia. The fruit is a white, yellow, orange, or red berry, in which the seeds are embedded in very sticky juice. The seeds are dispersed by birds, either with their dung, or when the bird tries to remove a seed from its bill by wiping it on a branch. The seeds are toxic to people. 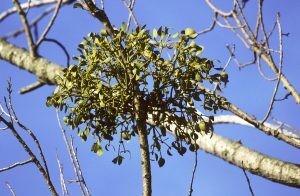 The name mistletoe is from Old Germanic, mistel (‘dung’) and tan (‘twig’), thus ‘the twig in the dung’, which aptly describes seeds of these plants, sprouting in a bird dropping left on a branch. 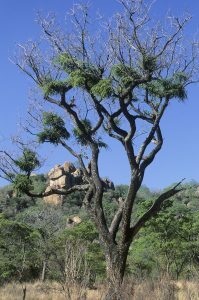 The common mistletoe (Viscum album) is distributed in Europe, apart from the far north, in north-western Africa, and across the Middle East to the western Himalaya. To the Celtic druids, mistletoes, growing on the sacred oak trees, possessed the power of the oaks, and they formed a part of their religious rituals. Mistletoes were only collected when the druids had visions, directing them to seek it. Carrying mistletoe branches, young men would walk around, announcing the coming of the new year. This custom was probably taken over by the British, and even after the introduction of Christianity it was preserved in a different form. On New Year’s Eve, branches of mistletoe were cut, adorned with fruits and brightly coloured ribbons, and hung from a beam at midnight, after which young men would lead young maidens beneath the mistletoe and wish them Happy New Year with a kiss. In Brittany, this plant is called Herbe de la Croix. According to an old legend, the Cross of Christ was made from its wood, which caused it to be degraded to a parasite. In Norse mythology, the god of love, Balder, son of Odin and Frigg, was troubled by ominous dreams, so his mother made all living and inanimate things swear that they would not harm him. The other gods tested the oath by shooting arrows and hurling stones at him, but he remained unscathed. However, Frigg had neglected to ask the mistletoe. This was noted by the evil and cunning Loke, who made an arrow from it and persuaded Balder’s blind brother Höðer to fire it at him, killing him. Formerly, in its entire area of distribution, birdlime was made from the gluey berries, utilized to catch thrushes and other small birds – a practice still taking place in the Middle East and the Himalaya. Soap was produced from the berries in the 1800s. Leafy mistletoes (Phoradendron) is a huge genus, containing between 235 and 240 species, distributed in warmer regions of the Americas, with most species in the Amazon Basin. The generic name is from the Greek phore (‘carrier’) and dendron (‘tree’), thus ‘carried on a tree’, referring to the epiphytic habits of this genus. It was named by Thomas Nuttall (1786-1859), a British printer, who came to the United States in 1808. Shortly after his arrival, he met botanist Benjamin Barton (1766-1815), who induced a strong interest in natural history in him. During the following years, until 1841, Nuttall undertook several expeditions in America, and numerous plants and animals are named after him. Phoradendron flowers are greenish and very small, only 1-3 mm in diameter. The fruits and their dispersal are similar to those of Viscum (see above). They are a favourite food of silky-flycatchers (Phainopepla). Desert, or mesquite, mistletoe (Phoradendron californicum) is found in the Mojave and Sonoran Deserts in southern California, Nevada, and Arizona, and in the Mexican states Sonora, Sinaloa, and Baja California, up to an elevation of 1,400 m. It grows on a wide selection of trees or shrubs, including mesquite (Prosopis), ironwood (Olneya tesota), catclaw acacia (Senegalia greggii), palo verde (Parkinsonia), and desert buckthorn (Condalia). Formerly, the fruits of this species were consumed by various indigenous peoples, who harvested them by spreading a blanket beneath the plant, hitting it with sticks. 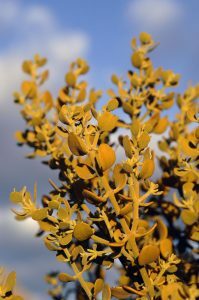 The oak mistletoe (Phoradendron villosum), also called Pacific mistletoe, occurs in western United States, from Oregon and California eastwards to Texas, and in northern Mexico. It is partial to oak trees (Quercus), but may also be found on various other broad-leaved trees or shrubs, including manzanita (Arctostaphylos), California laurel (Umbellularia californica), and sumac (Rhus). The specific name means ’hairy’, alluding to the dense cover of short hairs on the leaves. As its name implies, juniper mistletoe (Phoradendron juniperinum) is partial to junipers (Juniperus). It is native to western United States, from Oregon and California east to Colorado and Texas, and to the Mexican states Chihuahua and Sonora. Formerly, the berries of this plant were eaten by several indigenous peoples, while the leaves were used for tea, and also for treating various ailments, including stomachache, to relax tired muscles, and to diminish bleeding after childbirth. Dendrophthora is a neotropical genus of 120-160 species, closely related to Phoradendron. These plants are distributed from southern Mexico and the Caribbean, south to Peru and Bolivia. Dendrophthora costaricensis is a montane species, found between 1,100 and 3,500 m altitude, from southern Mexico south to Ecuador. This family consists of about 75 genera and 950 species. All are hemiparasites, with the exception of three terrestrial species, which are non-parasitic, and Tristerix aphylla (see below), which is holoparasitic. Most species are found in tropical and subtropical regions. As the family name implies, many species have beautiful, often brightly coloured flowers. The fruit is a berry, rarely a drupe or capsule. 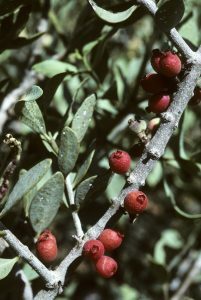 As in Santalaceae, the seeds are surrounded by a sticky substance, being spread by birds or, rarely, by small mammals. The genus Tristerix, comprising 12 species, is native to the Andes, from Colombia south to Chile and Argentina. These species are pollinated by hummingbirds and flowerpiercers (Diglossa), while the seeds usually are dispersed by various birds. Read about these two species of cacti, and many others, on the page Plants: Cacti. The gorgeous Tristerix corymbosus is restricted to the Andes in Chile and Argentina, found between 500 and 2,000 m altitude. It is parasitic on various plants, mainly in humid forests of southern beech (Notofagus). Its seeds are not only dispersed by birds, but to a great extent by tiny marsupials of the genus Dromiciops. 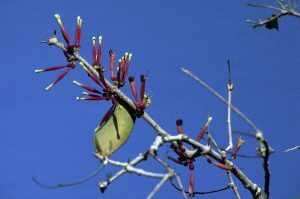 Agelanthus is the largest genus of showy mistletoes in Africa, containing about 61 species. They are parasitic on various trees, including species of Acacia and Combretum. Tapinanthus is a genus of about 40 species, almost all endemic to Africa, a single species also found in Yemen. Some species, formerly placed in this genus, have been moved to other genera, including Agelanthus. 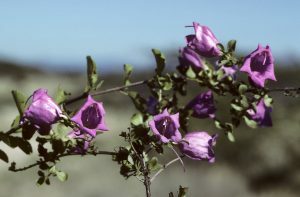 The genus Oncocalyx contains 13 species, distributed from Arabia southwards through eastern Africa to South Africa. O. ugogensis is an East African species, found in Somalia, Kenya, Uganda, and Tanzania. Plicosepalus is a genus of 12 species, extending from the Middle East southwards along eastern Africa to southern Africa, including Angola. P. curviflorus is widely distributed, from the Middle East, the Arabian Peninsula, and southern Egypt southwards along the Red Sea to Ethiopia, Somalia, Kenya, Uganda, and eastern Zaire. The generic name is from the Greek psittakos (‘parrot’) and anthos (‘flower’), presumably referring to the gorgeous flower colours. Psittacanthus ramiflorus grows in montane areas between 1,000 and 2,500 m, mostly in humid forests. It is distributed from Mexico eastwards to Panama. The genus Scurrula, containing about 50 species, is found in the Indian Subcontinent and Southeast Asia. S. elata is a Himalayan species, distributed from Himachal Pradesh eastwards to south-eastern Tibet. It is parasitic on various broadleaved trees, especially oaks (Quercus), Rhododendron, and Viburnum. This family consists of a single genus, Misodendrum, called feathery mistletoes, which are parasitic on various species of southern beech (Nothofagus). These plants, 8 species altogether, are restricted to South America. The generic name is from the Greek misos (‘hatred’) and dendron (‘tree’), thus ‘hates trees’, referring to the parasitic habits of this genus. The common family name refers to the feathery look of some species, especially M. linearifolium, which grows on Nothofagus antarctica and N. betuloides, from Tierra Del Fuego north to central Chile. This species has been used medicinally, rubbing it on sore muscles. Most orchids live in symbiosis with the mycelium of underground fungi, which is attached to the rhizome or root of the plants. When an orchid seed is about to germinate, it is completely dependent on this mycelium, as it has virtually no energy reserve, obtaining the necessary carbon from the fungus. Some orchids are dependent on the mycelium their entire life, but their relationship is symbiotic, as the orchid delivers crucial water and salts to the fungus. A few orchids, however, are parasitic on the fungus. As they do not possess chlorophyll, they are not able to deliver nutrients to the fungus. Three examples are shown below. The bird’s-nest orchid (Neottia nidus-avis) is found in most of Europe, eastwards to central Siberia, and also in north-western Africa, Turkey, Iran, and the Caucasus. Its name stems from the thick, tangled root, which somewhat resembles a bird’s nest. To germinate, seeds of this plant are completely dependent on a species of fungus, Rhizoctonia neottiae (family Ceratobasidiaceae). Coralroots (Corallorhiza) are a genus of 11 species, all but the circumboreal common coralroot (C. trifida) restricted to North and Central America, and the Caribbean. All are entirely dependent on fungi to obtain nutrients, again with the exception of common coralroot, which contains some chlorophyll. The generic and popular names allude to the entangled rhizomes of these plants, which resemble corals. Whose spotted flowers hang meanly down. Previously, several indigenous tribes made a decoction from the dried stems to treat colds, pneumonia, and skin problems. Pacific coralroot (Corallorrhiza mertensiana), also called Mertens’s coralroot, is native to damp coniferous forests of north-western North America, from Alaska south to California, and eastwards to Alberta, Montana, and Wyoming. The specific name was given in honour of German botanist Franz Carl Mertens (1764-1831). Strangler figs (Ficus) are not true parasites, as they do not possess haustoria. Instead, they begin their life as an epiphyte in a tree, the seed often sprouting in a pile of bird dung, delivered by the bird which ate the fig fruit. Over the years, aerial roots of the young strangler fig grow down to the ground, where they take root, while other roots wrap themselves around the host tree, over time completely enveloping the tree, which is eventually strangled to death. As the trunk of the host tree decays, it leaves the fig tree as a hollow cylinder of aerial roots. Many strangler figs also often grow on buildings. Read more about fig trees elsewhere, see Plants: Pipal and banyan – two sacred fig trees. For pictures of various fig species, see Plants: Ancient and giant trees. The dye fig (Ficus tinctoria), also called humped fig, is widely distributed, found in the Indian Subcontinent, southern China, Southeast Asia, Malaysia, Indonesia, northern Australia, and on numerous Pacific islands. This species has its name from the traditional usage of the fruits to produce a dye. The name tinctoria is Latin, meaning ‘used for dyeing’.